If you already own a domain name for your team you can use it instead of your free [myteam].teamthing.com domain name. Step 1: Map the domain in your teamthing admin area. So, lets go to the admin area for your teamthing site. 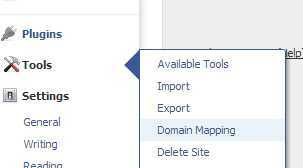 In here you can add the domain to be mapped to your site. Once you click ‘Add’ then that’s all you need to do in your teamthing admin area. At this point you need to have access to your domain control panel. Details of how to access this panel should have been provided to you by your hosting provider when you bought the domain name. There are many different types of domain control panels. 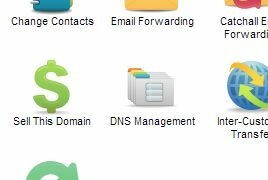 If you are using a different panel to the one demonstrated below, or managing the DNS with the domain name registrar then the principle is just the same, the method of adding it might be a little different. However, most control panels will have an option similar to ‘Advanced DNS’, we will assume you have clicked on this option in your control panel. N.B. If you manage several different domain names through your control panel then select the domain from which you would like to change. If you already have an A record configured then you need to change it to point to our teamthing.com server. Change that IP address to the dedicated IP for teamthing.com (178.62.36.153). N.B. Change both the empty ‘Subdomain’ record and the * record to point to the new address if both these options are available. If you are setting up A record for the first time then the type is “A” A Record. You are now finished. However, the changes that you have made to your DNS settings may take up to 24 hours to take effect. To check to see if the changes have been successful you should try to enter your old domain name into your browser and it should now, magically, take you to your teamthing.com website.